Every city, every region has its popular fast food. I am sure you all have your favorites. My family loves Indian street food, well known as Chaat - Pani Puri, Shev Puri and so on. But, we love Samosa too. Rather than eating out, I like to cook my family's favorite snacks at home. The best part is you get to decide which ingredients will be a part of your diet. Today, I am sharing the homemade versions for all these fast food items, which you can make for your loved ones. Let me start with the basics for Chaat, the two chutneys. Teekhi Hari Chutney / Cilantro Mint Chutney - A spicy chutney made of cilantro/coriander leaves and pudina/mint leaves. Khatti Meethi Khajur Imli Chutney - A sweet sour chutney made of khajur/dates and tamarind/imli. Make these chutneys ahead and freeze them in freezer and microwave safe containers. Anytime you want to eat Pani Puri, thaw them. Or microwave them for a couple minutes. If you are in a place where dates are not available, but dry Prunes are, you can try this Prunes Tamarind Chutney. I use prunes as a substitute for dates and it tastes same as Khajur Imli Chutney. Now some recipes where you can use these chutneys. For all the above recipes I make Puris at home. But when I don't have time, I use store bought Tortilla Scoops. Crunchy corn scoops taste slightly different, but are equally good. If you want to try something new, take a look at Tortilla Scoops Shev Puri and Dahi Puri. As far as I know, Samosa is the most popular fast food. 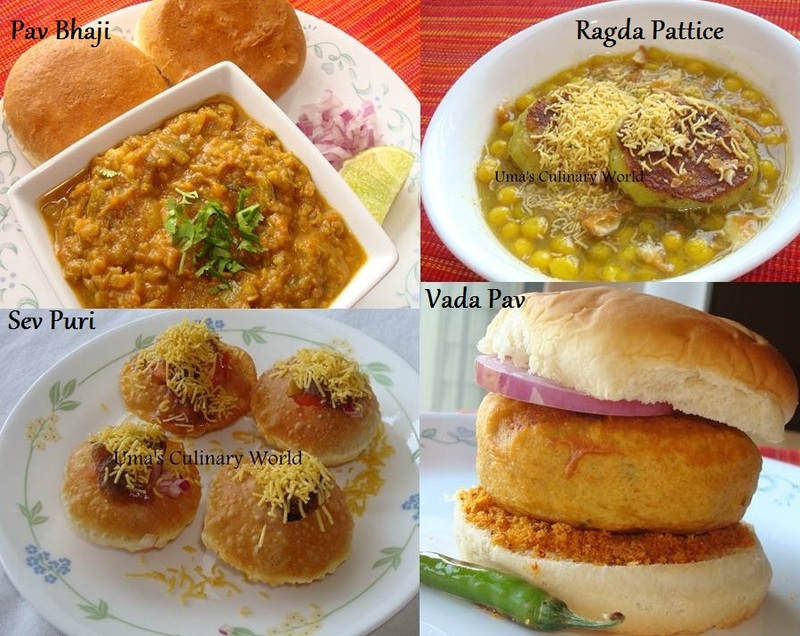 There can be a big debate over Mumbai's Vada Pav is more famous or Pav Bhaji. Try all these at home and pick your favorite. quite a nice collection u have here! !